Yesterday, I had the privilege of announcing here the upcoming Space: 1999 graphic novel, "Aftershock and Awe," and today I get to break even more Space: 1999 news. 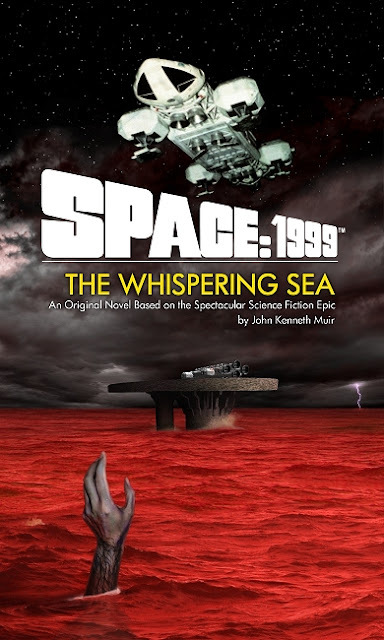 In particular, it's about my upcoming Space: 1999 novel for Powys Media, The Whispering Sea, available in March 2012. So here it is: the new, ultra-creepy cover art, just officially approved, created by the ultra-talented Ken Scott. Delightfully, this macabre imagery captures perfectly the atmosphere of the book, which follows up on my thesis about "the horror mythology of Space: 1999." As I've written here before, The Whispering Sea takes place in the Year 2 chronology, between the introductory episode, "The Metamorph" and the second episode, "The Exiles." The subject matter involves Maya's integration on Alpha after leaving Psychon, and how she came to assume duties as Moonbase Alpha's science officer. I had a great time writing the book, and I'm thrilled it will be published in just a month or so. Check out Powys Media here for more information about The Whispering Sea, as well as the upcoming re-release of my first Space: 1999 novel, 2003's The Forsaken. That novel looks terrific. The cover is like the perfect fusion of everything you enjoy about horror and science ficiton. Keep us posted. I have purchased and enjoyed previously Powys Media published Space:1999 novels. I look forward to your new novel. Thanks for the comment on the new "Whispering Sea" book cover. SFF: "The cover is like the perfect fusion of everything you enjoy about horror and science fiction." -- Well said, sir. That's exactly how I'm viewing it! SGB: I'm glad you like the cover, and I hope you enjoy the novel as well! I'm especially glad the cover is being well received! You did an absolutely beautiful job, and you NAILED the essence of the book. I love, love, love this cover. Thank you for all of your hard work on the imagery, and for bringing my story to vivid (blood-red) life! Fantastic, John! Congrats, and thanks to Mateo and everyone @ Powys for bringing us another new S:1999 adventure! Beautiful work Ken! If you provided the artwork for John's story, you did a splendid job. It's popping!